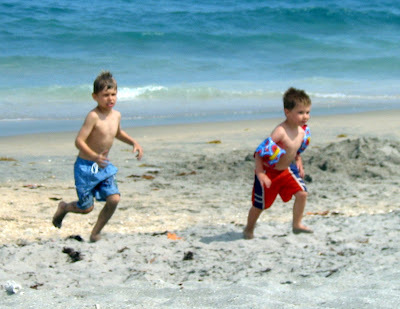 This picture (taken at Boynton Beach, FL) pretty much sums up the bulk of activity during our Spring Break escape to Lake Worth, Florida this year - Kyle chasing Ethan after Ethan annoyed Kyle and shortly to follow, a push, shove, kick or thump. We had a great time in Florida visiting with Mike's parents who've been down there for the winter. We camped nearby their trailer and spent most of our days at the beach. Great fun body surfing and swimming and generally just laying out in the sun. We found a GREAT Cuban restaurant/walk-up in Lake Worth called Havana. Awesome Cuban coffee (made with melted sugar and milk) and fantastic guava pastries and awesome appetizers like papas rellena. Yummo! Saw an alligator in the water outside our tent (yikes) and had raccoons get into our stuff outside the tent one or two nights. Saw four baby raccoons trapped in the local dumpster - one of the guys who stays in the park (Wayne) makes it a point to help them escape the dumpster every Tuesday (!!!). Mike took me out to dinner in Delray Beach one evening (no kids) to an awesome place called Cafe Luna Rosa where we sat outside and watched the thunderstorm and enjoyed some truly awesome Italian food - insalata caprese, Luna Rosa specialty pasta (creamy tomato vodka sauce with pancetta) and good wine. Bread came served with oven roasted garlic in olive oil. Fabulous. 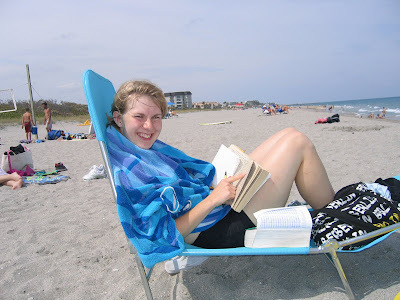 Delray Beach is an awesome place - I'd love to visit there again. On our last day, we spent the morning at the beach before packing up camp and then heading to The Grumpy Grouper (local restaurant) for a late lunch to celebrate my birthday (not until the 16th). Tatjana was brave enough to try alligator tail and enjoyed it. So pretty much - the vacation was made up mostly of the beach and eating. What more could you ask for? !